With my interest renewed in building ship-in-the-bottles I decided to try to further my skills and take a path of self learning. I had only limited instructional materials available as well as some examples from other builders and the instruction sheets from my old kits as guides. I first decided I wanted to re-create the original “Ship’s-A-Sailin’” SIB Kit model line and had already built the “Lively Lady” but I also wanted to work on a more remedial model to help sharpen my skills. I pulled out my old “Modeling Ships in Bottles” by Jack Needham, gave it a thorough read and realized his first “Simple Model for Beginners” was equivalent to the “Skeeter” model in the S-A-S kit line so decided that this would be my next build. I also wanted to experiment with a head-land background and I had a short but fat round bottle I wanted to try. 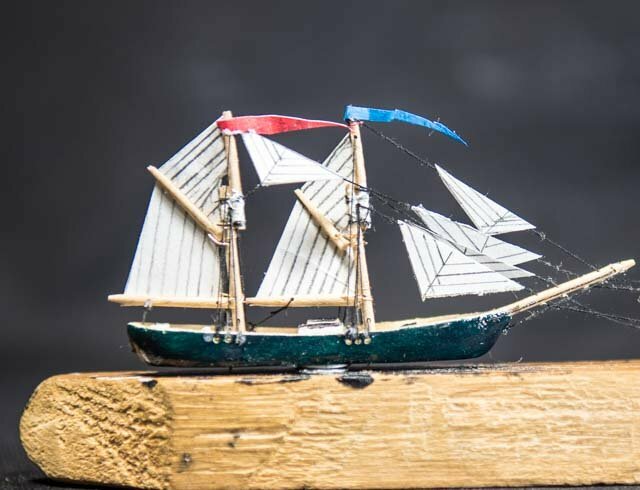 The model is a simple two masted schooner. For being a simple model I had difficulty getting a hull correctly shaped and ended up cracking two before I got one – I don’t recall ever having a problem shaping a hull in the past. On this model I decided to try and make the sails out of paper instead of the using the extra sail cloth I had left over from my 1/8” scale “Elsie”. This went OK but I marked the seams a bit too heavy in pencil and slightly creased one sail during insertion. I also tried to color my “Model Magic” play-clay sea with acrylic paint to get a deeper, warmer blue but the paint didn’t mix into the putty well, it sort of sat on top instead of mixing in, didn’t dry as fast as I would have liked and it made the putty somewhat sticky and soupy. I ended up marking up the model with the colored clay but Jack did suggest getting some putty on the sides of the hull to simulate sea-spray. However my background came out well and I included a little head-land and a lighthouse. Again I attempted a Turk’s Head knot which turned into a “decorative braid”. I even embedded a foreign coin into the melted wax seal on the cork. 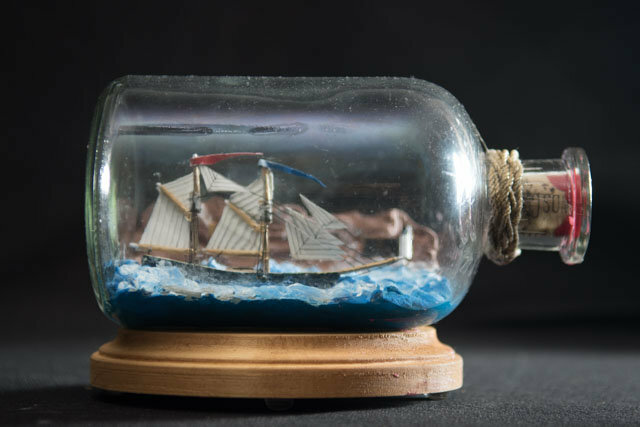 The ship is a little small for the bottle which has a difficult dimension of being short and stout but the addition of the background and light house helps fill the space. So I had some lessons learned but still came away with a nice model a step above my early kit builds. Looks good to me! Nice work! On to the next one?! Thanks Jeff, I'm a few lessons past this now...I'll post them one at a time.